He got down the hill ok, and he passed the small field, and then he got to the narrow place. 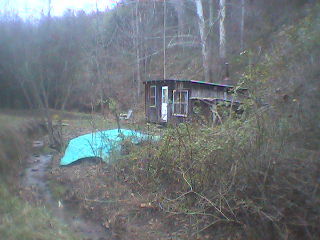 (Where the creek is eroding the driveway away faster than we can cut into the hill to widen it.) And Jeremey told him to stop, but he kept on going.. sliding right off the driveway, and rolling the SUV into the creek. They tried winching it out. That didn't work. They didn't even think to ask neighbor Jimmie to once again haul a vehicle up the driveway. His tractor couldn't have gotten this one out. They had to rent a "small backhoe on treads, like a tank" to do the job. The comments plugin looks very slick. Glad to see it included with ikiwiki!